Wildfires are a growing natural hazard in most regions of the United States, posing a threat to life and property, particularly where native ecosystems meet developed areas.Four out of every five wildfires are caused by people. 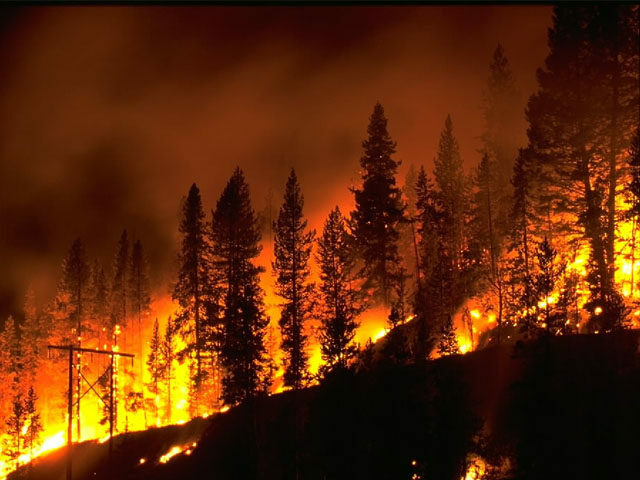 However, because fire is a natural (and often beneficial) process, fire suppression can lead to more severe fires due to the buildup of vegetation, which creates more fuel. In addition, the secondary effects of wildfires, including erosion, landslides, introduction of invasive species, and changes in water quality, are often more disastrous than the fire itself. The word "fire" refers to the natural phenomenon that occurs whenever a combustible fuel comes into contact with oxygen at an extremely high temperature. Fire is the byproduct of a chemical reaction in which fuel stored in a combustible fuel is converted to a gas. A fire's flame refers to the visual indication of light that occurs once the gas is heated, and is evidence that a fire has taken place. The Fire Triangle was developed by natural scientists as a simple way of understanding the factors of fire. Each side of the triangle represents one of the three ingredients of fire – oxygen, heat, and fuel – demonstrating the interdependence of these ingredients in creating and sustaining fire. Remove any of these three factors from the triangle, and a fire will die. The interaction of the three equal sides of the fire triangle: heat, fuel and oxygen, are required for the creation and maintenance of any fire. When there is not enough heat generated to sustain the process, when the fuel is exhausted, removed, or isolated, or when oxygen supply is limited, then a side of the triangle is broken and the fire is suppressed. Fire is Nature's Housekeeper Since the dawn of time, fires have burned regularly, consuming vegetation, accumulations of insects and diseases, and triggering a rebirth of forests. Without periodic fire, plants and animals requiring nutrients and vegetation from other parts of the cycle disappear. Fire, in places where it is a crucial part of the ecosystem, promotes vegetative and wildlife diversity, helps maintain wilderness and wildland areas, and eliminates the heavy fuel accumulations which can ultimately lead to catastrophic wildfire. Many plants have evolved adaptations that protect them as a species against the effects of wildland fire, and some are even strengthened by it. Nearly every ecosystem in the country has some kind of fire dependent plant or tree. As one of the most important natural agents of change, fire plays a vital role in maintaining healthy ecosystems. Prescribed fire reintroduces the beneficial effects of fire into an ecosystem, producing the kinds of vegetation and landscapes we want, and reducing the hazard of catastrophic wildfire caused by excessive fuel buildup. They destroy wilderness, property, and lives. As more homes are built in and around forested areas, and as more people take to our country's wildland areas, wildfires are also on the rise. Through discarded smoking products, sparks from equipment in operation, arced powerlines, campfires, arson, debris burning and other careless means, wildfires are often ignited, and its fires such as these – unplanned, uncontrolled and unnecessary – that could be most easily prevented. • Don't park your vehicle on dry grass. • If off-road vehicle use is allowed, internal combustion equipment requires a spark arrester. • Know your county's outdoor burning regulations. Unlawful trash burning is a punishable offense. • At the first sign of a wildfire, leave area immediately by established trails or roads. Contact a Ranger as soon as possible. If escape route is blocked, go to the nearest lake or stream. • Leave campsite as natural as possible, traveling on trails and other durable surfaces. • Inspect your site upon leaving. • Never take burning sticks out of a fire. • Never take any type of fireworks on public lands. • Keep stoves, lanterns and heaters away from combustibles. • Store flammable liquid containers in a safe place.